The sales technology landscape is insanely crowded these days with multiple categories of solutions. You’ve got CRM, sales enablement, sales engagement, sales automation, social selling tools, and so forth. I get it if you aren’t sure what you need to succeed. All these labels can make it a little confusing sometimes. Doesn’t a CRM system enable me to engage in sales activities? If I am engaging, mustn’t that mean I am enabled as a salesperson? Let’s throw away the labels for a moment and categorize technology by the ways sales development reps (SDRs) want and need to work. Here are some of my favorite tools to help you out in each of these three sales skill categories. Whether you are researching inbound leads or hunting for leads, there are some terrific sales technology tools to help you look before you leap into sales calls. Here are some to consider. LinkedIn Sales Navigator: A lot has already been written about this social networking solution, so I’ll give you the thumbnail sketch. With LinkedIn Sales Navigator, you can find the right target prospects and gain key insights. Sales Navigator can be a great tool in several categories here — it helps you look for potential leads, learn more about them, and offers an easy way for you to connect and communicate. Complex selling requires you to take a step outside LinkedIn Sales Navigator, but this tool can certainly help open the door to a dream account. Just don’t be one of those salespeople when you’re using LinkedIn. Followerwonk: Maybe you aren’t sure if your target audience is active on Twitter. One quick and easy way to find out if potential customers are on this social media platform is with Followerwonk. Followerwonk lets you search for Twitter users, but it also enables you to discover more about who follow your competitors on Twitter. Hunter.io – If you like prospecting by email, then Hunter.io may be your jam. 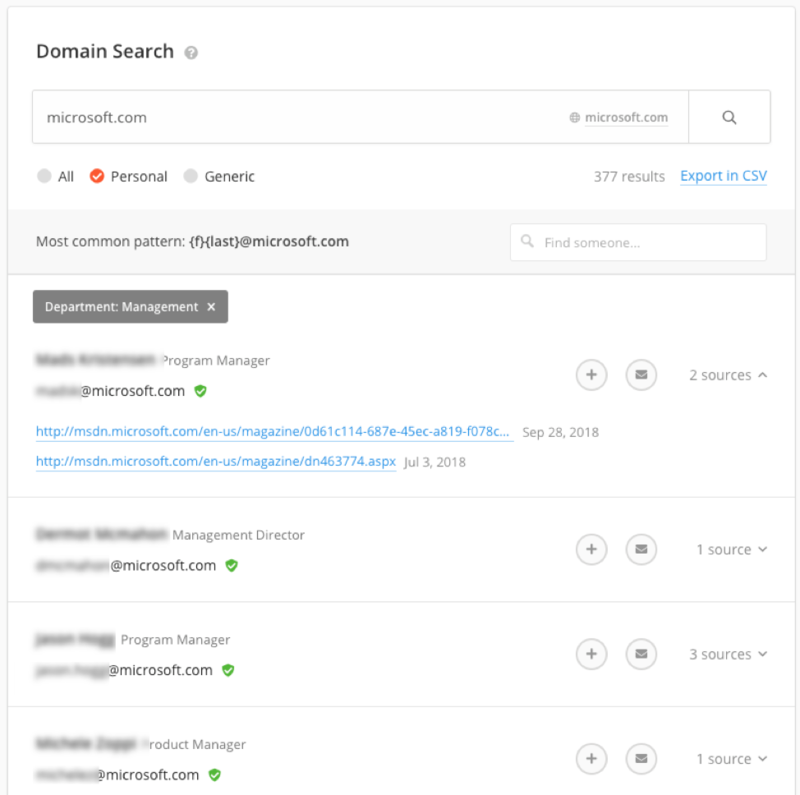 This platform allows you to search by domain or specific person to discover email addresses. However, Hunter.io isn’t perfect. There were a few individuals whose emails I couldn’t find on Hunter.io, but it may not be a bad place to start. Snov.io: Is similar to Hunter.io. Use Snov.io in combination with LinkedIn (or on its own) to discover emails for your target prospects. DiscoverOrg and ZoomInfo: DiscoverOrg and ZoomInfo, which is now owned by DiscoverOrg, offer more in-depth insights and data for your entire sales team. You can plug these solutions into your sales process to discover more than just emails when it comes to prospecting. GDPR Compliance — Hunter.io has a nifty blog post outlining GDPR concerns for B2B sellers doing business in the EU. One point that may surprise you: you should include an unsubscribe link in your one-to-one emails. CAN-SPAM Compliance — HubSpot provides a 14-point checklist to help you determine if your cold sales email is actually spam. The overarching theme of those points — your email should be personalized, relevant, and more about the recipient than about you and your product. Read the full post for all the details. CASL – Canada’s Anti-Spam Law is a fairly recent anti-spam law that organizations must adhere to when sending electronic messages (i.e. email, texts) in connection with “commercial activity.” Deloitte has put together an article on CASL FAQs to answer common questions. What’s important to know is that CASL applies to those who are sending emails from Canada, or to Canadian recipients. Learning more about prospective customers is an essential step in making effective connections. Here are some sales technology tools to help you stay in-the-know and on top of your game. Feedly: Feedly and other feed reader/aggregator tools let you monitor the sites and topics that are most important to you. Set up feeds by industry, by subject, for a specific company. The point of a tool like Feedly is to make your research time a little more efficient. Awario: Awario is a fairly new player on the social listening scene, but it has some slick dashboards and a cool interface that helps you quickly identify who’s having conversations about your brand, a competitor, or a product category you play in. Awario even offers social selling features to help you inject yourself into conversations on social media. Other tools for social listening include Mention (integrates with Slack), HootSuite, and Agorapulse. Also, don’t forget LinkedIn Sales Navigator. Google Alerts: Get the latest news about key prospects or industries right in your inbox with Google Alerts. As soon as a news story or press release hits, you can get the details by email (or RSS feed if you wish). You’ve got a lot of sales technology options to help you connect with contacts these days. Make the most of email, social media, and phone calls with the following technology options. Vidyard is my favorite video for sales tool, but some others include Soapbox by Wistia, OneMob, BombBomb, and Dubb. Crystal: Crystal claims to know a lot about the people whom you want to reach. In some cases, this tool is spot on correct. In other instances, not so much. However, if you’re going into an email or LinkedIn InMail cold, you can gather some clues to help you possibly make a better impression than you would have without Crystal’s insights. 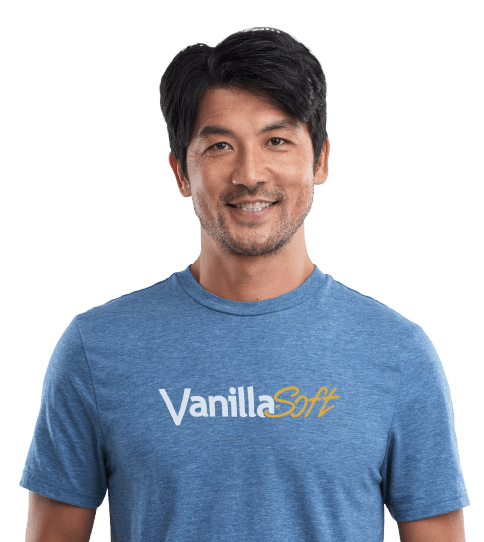 Voicemail Drop from Vanillasoft: Getting voicemail on the first (even second and third) call attempts is a fact of life for salespeople these days. You need to have a succinct, good-sounding voicemail that builds trust with the listener. Use a sales engagement solution like VanillaSoft that lets you drop a pre-recorded message into your prospect’s voicemail. Zoom: Zoom and other web meeting software lets you take your scheduled demos to a more personal level when you flip on the webcams. Many people are still camera shy these days, so you should never just set your web meeting solution to turn on the cameras automatically. Even if they don’t opt to show their face, think about keeping your mug on camera. Let them see you connecting to them in a personal way. Other options include GoToMeeting and Skype for Business. SMS Text in VanillaSoft: So many people prefer using mobile devices today for communicating, and text messaging is often the preferred method of communication. Try using SMS text messages in your follow up with leads, but remember to follow the rules and regulations around using SMS. All of the sales technology I’ve mentioned today can give you real-time information and data-driven insights to help you keep up in the fast-paced world of selling. However, they aren’t a replacement for proper sales techniques and talent. Sales managers, don’t forget to invest in training and sales coaching so that you get the most out of your people and technology. Sales reps, make it your responsibility to seek out opportunities to improve your skills.